The plans for the new pavements, under construction, on Norwood Road & Tulse Hill Station Rise can be seen online at: http://www.streetworks.london/documents. Works are due to be finished by the end of this year. Cyclists asked for changes near Elmcourt Road and there is an opportunity to see & comment on the revised plans to improve cycling in Norwood Road on Wednesday 21st June between 6pm to 7pm at Bon Velo bike shop 495 Norwood Road SE27 9DJ. StreetWorks is a community-led project to improve Norwood Road between Robson Road and Tulse Hill station (and in the longer term the one-way system at Tulse Hill) with funding from Transport for London and supported by Lambeth council. Its colder on the top of the hills around West Norwood! After Tuesday’s ( 15 Dec) snow fall most of the snow had melted in the centre of West Norwood by Saturday but once you get higher than 50 metres above sea level the snow and ice stayed much longer on the roads and pavements. Martin Sachs , who heads Lambeth’s Highways team, told residents at the Norwood Forum last week that in wintry weather his priority is to grit the busiest roads and those on hills twice a day , using special gritter vehicles – apart from red routes which are looked after by t he London Mayor’s Transport for London. Traffic speeds up the melting process on roads but gritting pavements is a slower manual process done by staff who normally sweep the streets. Busy pavements outside shopping centres, schools and hospitals have priority. Salt bins are left unlocked for residents to use. 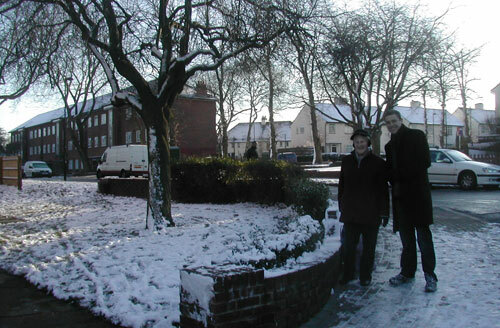 More snow fell on Monday afternoon (21 Dec) causing chaos throughout London as traffic struggled with the icy roads. The resulting gridlock prevented gritters getting on the road quickly. Gritting will continue throughout the night.